How PrettyLittleThing increased their sales and recovered their abandoners. Cart abandonment is a huge issue for all online fashion retailers, with the latest research finding that over 70% of shoppers leave an order without completing the purchase. PrettyLittleThing worked with SaleCycle to combat this by implementing a successful Cart Abandonment cycle. During a business review, SaleCycle suggested developing a Browse Abandonment campaign to recover customers who hadn’t reached the cart, bringing more potential shoppers back to the PrettyLittleThing site. From their site to your door, PrettyLittleThing provides the ultimate fast fashion experience. Using SaleCycle’s clever browse remarketing, PrettyLittleThing is able to dispatch abandonment emails automatically to customers who’ve left their site after taking a look around – tempting them back to make that purchase, and keeping their brand fresh in the customer’s mind. The addition of Browse Abandonment has already delivered successful results. After only 3 months, this new remarketing campaign has seen an average click rate of 20%, and driven an average conversion rate of 18%! Just 3 months after implementing Browse Abandonment, we’re already seeing great results from triggering emails based on our shopper’s behavior. 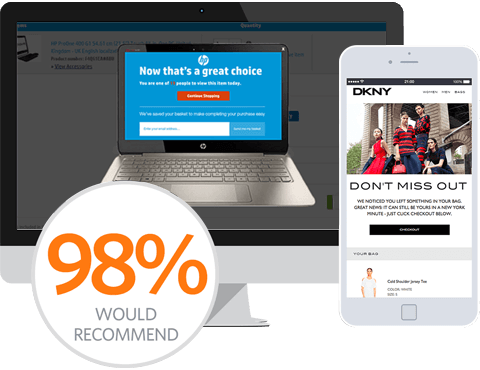 We’d definitely recommend SaleCycle and their remarketing options to any brand looking to increase conversions, and optimize the customer journey. Turn them from browsers into buyers. We track the behavior of everyone who visits your site, enabling you to personalize their experience and inspire them to convert. We’ll reduce abandonment rates, collect more emails, and ultimately turn more of your visitors into customers.